TULARE, Calif. (Feb. 12, 2012) — When World Ag Expo closed its 45th anniversary run today, it will go into the record books as a really big show — big crowds, big names and big events. The three-day show experienced both sunny, blue skies, and cold, rainy skies but attendees didn't seem to notice the difference. The displays were busy with buyers researching new products and technology. The Top 10 new product winners were especially thrilled with the exposure the recognition earned them, and with the response from attendees. "This has been a great show," said Scott Korthuis, product manager for OXBO International, which earned Top 10 New Products status with its new raspberry harvester. "There has been a lot of interest in the raspberry harvester and all of our products," Korthuis said. "We have gathered lots of solid leads and sold two pieces on opening day. We also met prospective buyers from all over the world." A tour by GOP presidential hopeful Newt Gingrich drew huge crowds, and Gingrich accommodated many requests for photos and autographs. Former President George W. Bush delivered the keynote speech at the kick-off gala for the International Agri-Center's new Ag Warriors Program. He followed the speech with a casual question and answer program. 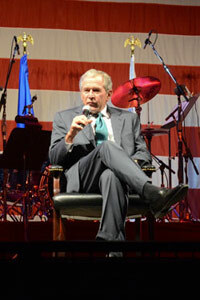 A highlight of the show week was a presentation by former president George W. Bush, who was the keynote speaker at a gala in the 60,000-sqare-feet Entertainment Pavilion. President Bush's speech helped to kick off the International Argi-Center's new Ag Warriors program, which will help returning veterans find training, internships and careers in agriculture. President Bush was received with a standing ovation and thunderous applause as he took the stage. He joked with the audience and noted that he is enjoying his freedom and "glad to be out of Washington." He also described America's peaceful transfer of power as "an amazing thing." Other big events included over 2,000 FFA students from all over California gathering on the final day for the FFA Assembly. a keynote speech by Michael Peterson. The second annual Concerts for a Cause featured a performance by Trace Adkins, with opening act Brett Eldredge. Funds raised will support ag education programs locally and beyond. The 2013 World Ag Expo will be held Feb 12-14, with volunteer chairman Joe Rainey. and improve," Rainey said. "I am looking forward to making the 46th Expo another great experience for buyers and sellers." Editor’s Note:This release is from the International Agri-Center. For information on World Ag Expo 2013, contact the International Agri-Center at 800-999-9186 or visit worldagexpo.com.